Small scale incremental developers are concerned with enhancing the character and economic vitality of neighborhoods through flexible, human-scaled, mixed-use buildings. In other words, a small developer’s focus is in building places the way they have been built for centuries; piece by piece adapting to changing forces along the way. This is in direct opposition to the more popular trend of development, which is to build it big and all at once. The real estate produced from this mode of development is usually expensive, poorly designed, and hinders the organic growth of a city or community. It also shows that the developer at this scale, lacks basic understanding of the neighborhoods they ‘invest’ in, either intentionally or unintentionally. This is something that a small developer does well. Giovanni Battista Nolli's 1748 Map of Rome. The entire document is about 6ft x 7ft in dimension and comprised of 12 smaller portions. The Nolli Map has become one of the most appropriate ways to understand existing spatial relationships and plan future development. Enter the Nolli Map, the most underutilized tool in the designer/developer tool box. A Nolli Map is a two-dimensional plan drawing used to understand the accessibility and flow of space within a city or neighborhood. The first Nolli Map was drawn by the Italian architect from where the map derives its name from, Giovanni Battista Nolli. For purposes of dividing the city into wards and planning future public works, in 1736 Pope Benedict XIV commissioned Nolli to create the most accurate plan drawing of Rome ever made. Giovanni documented every building within the city and consequently every space. Unique to the Nolli Drawing is the representation of public space inside buildings, as part of the urban realm. There is no distinction between inside and out; only space and mass. Private spaces are rendered as black and public spaces accessible to everyone are left white. 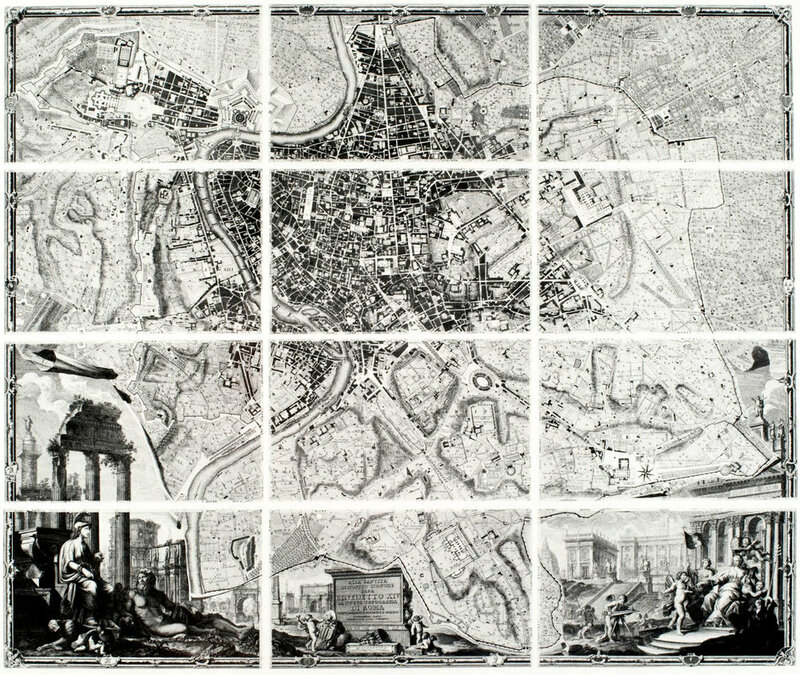 The Nolli Map of Rome presented the Eternal City in a way that deepened the comprehension of its neighborhood fabric. The most important observation a Nolli Map reveals is the clear distinctions between public and private space. This can be simplified as “places people can go” vs. “places people can’t go”. Clear separations between the two realms are a critical component of safe neighborhoods. They also help the small scale developers comprehend the flow of space and the movement of people, goods, and money within those spaces. Public spaces include streets, squares, and walks but also porches, yards, commercial space, lobbies, and vestibules. Understanding the public vs. private relationship—or lack thereof—within a given neighborhood is the foundation for establishing walkable, human-scaled communities. 2. Uncovering the urban and architectural pattern language of a neighborhood. Cities and neighborhoods have a language. That language is spoken in terms of spatial patterns that organize the places humans inhabit. A Nolli map will reveal these patterns both on an architectural and urban scale. Streets are the clearest examples of an urban pattern. They can be organized in a grid, linearly, radially, organically, or some hybrid of these. Certain architectural patterns will respond to the urban organization. For example at Seaside, there is an architectural pattern of porches fronting the street, acting as a mediator space between the public and private realm. As a small developer, fitting into this existing pattern language is essential to positively nurturing the walkability, sustainability, and functionality of a neighborhood. They are great clues to guide the small developer in what should be built. An Excerpt from Seaside, Florida Nolli Plan along Tupelo Street. The solid black masses represent the private residences. Notice the pattern of porches facing the public streets and how they contribute the sequence of public space. Image courtesy of Dhiru Thadani, 2015. Sustainable, walkable places have a very legible flow of public space between buildings and the urban realm. They also have a variety of architectural patterns, because there are different uses required to sustain the neighborhood. More private spaces like residences will have less public space porosity breaking up their massing than a commercial space will, where goods and services are exchanged for money. Nolli Map of an existing neighborhood reveal all of these things and one will be able to determine the components that are missing. These missing links are perfect opportunities for small scale developers to intervene responsibly into a neighborhood. Specifically, Nolli maps will reveal the absence of the "Missing Middle" - super flexible building types that are between the single family home and the multi-unit apartment building. These Duplexes, Triplexes, Quadplexes, Carriage houses are important components of valuable and sustainable communities that can potential build individual wealth. Thankfully, their demand is increasing. 4. Understand that your building is not an isolated event but a small piece to a much larger system. This aerial image of Barcelona shows just how important it is to pattern individual buildings together to create the beautiful and larger community. True value is placed on the neighborhood first and individual buildings second. My last point is a summation of the former three. Mapping an entire target neighborhood as a Nolli will inevitably reinforce to the small developer just how insignificant one piece of land or property is when viewed in isolation. It will illustrate that the true beauty of a place is less about one building, and more about how a coalition of carefully located buildings craft space and work together to produce great places for humans. I realize this is difficult for large-scale development because the culture there is to protect the investment, which is the building. But that’s just it. Small developers are protecting the investment, that investment being the neighborhood. They invest in the protection and enhancement of its spaces, patterns, economy, and architecture by developing responsive, flexible and contextual buildings. Such an investment allows the entire neighborhood to flourish and so will the developer’s pocket. Everyone wins. As a disclaimer, I suggest living in the neighborhood you are developing in. It cements your investment of time and money in a place, which is the ultimate commitment. Not only do you care about your property, but you care about its context and socio-economic support system. Why? Because you live, work and play there as well. Nolli Maps help small developers understand their focus neighborhoods. Consequently, this creates economic value for the community and themselves by financing better products. Fabric[K] Design's Zoning and Possibility Packages provide a comprehensive analysis of potential development properties you're looking at. They are great first steps to developing a profitable real estate asset for both you and the community. For more information and pricing check out our Products and Services page. This article was written by architect Marques King, and was first published by the Congress for the New Urbanism Online Journal, Public Square in January 2017. Learn more about small scale development by visiting the INCREMENTAL DEVELOPMENT ALLIANCE website! CURIOUS ABOUT A POTENTIAL DEVELOPMENT IN YOUR NEIGHBORHOOD? OUR ZONING AND POSSIBILITY PACKAGES CAN HELP. CLICK HERE TO LEARN MORE!